Jason and I spent (Spent: The wing position of many aquatic insects when they fall on the water after mating. The wings of both sides lay flat on the water. The word may be used to describe insects with their wings in that position, as well as the position itself.) the day organizing and packing gear needed to camp and work on a large, clear, entirely spring-fed river southeast of Fairbanks. 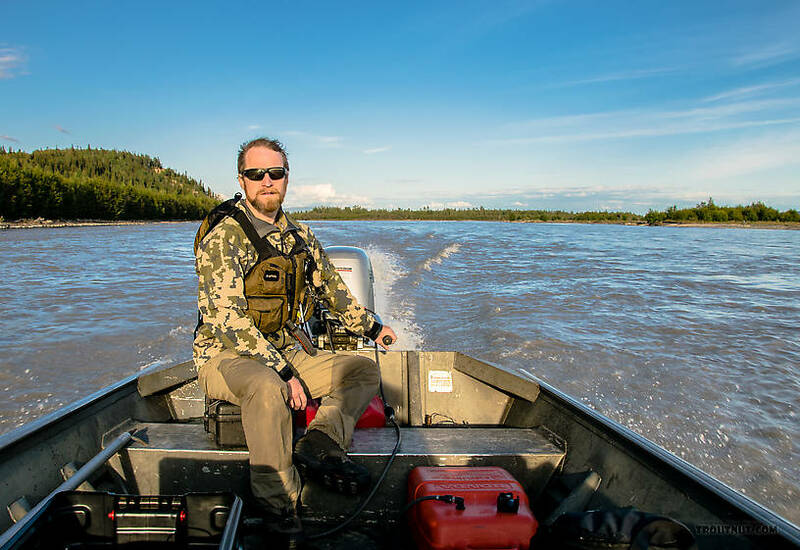 At ~6:30 p.m. we arrived at a mud/gravel boat landing and parking area loaded with the vacated rigs of opening-day moose hunters accessing the Tanana River � their highway into the bush. As we donned our waders and prepared to launch the boat, I heard, then saw, my first peregrine falcons. Their nest was high on a cliff opposite the boat landing, but we did not see them until the pair did a �fly-by� overhead. Magnificent birds. Skies were mostly clear and the sun was bright as we exited the launch area and headed down the Tanana River with the current against a mild westerly breeze. 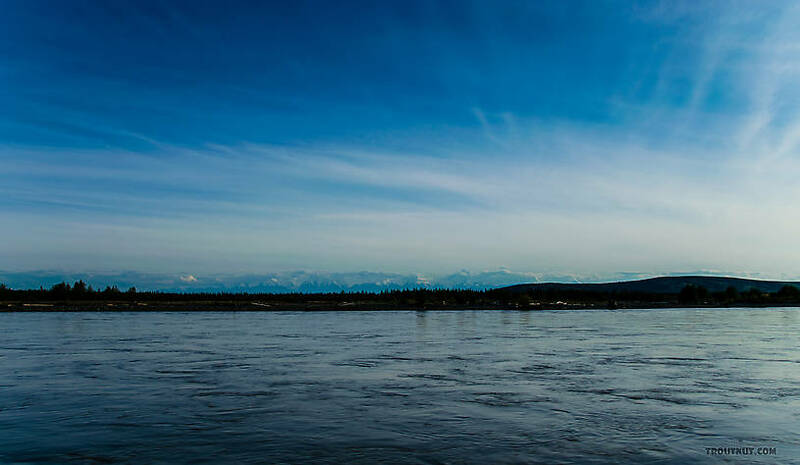 Snow-capped peaks of the Alaska Range could be seen low on the horizon to our southeast. The old Honda jet outboard motor expressed frequent disagreement with us about which gear it should be in, slipping from forward into neutral at the most inopportune, high-speed moments and showering Jason with cold water every few minutes. Jason navigated westward through a labyrinth of islands in the wide, shallow slurry of gray glacial melt-water. It took approximately half an hour to travel downstream to the mouth of the study stream, which was well concealed by various islands and sloughs. Within a minute, water clarity went from zero to infinity as we headed up the tributary to Jason�s study site. In the lower couple miles we passed numerous cabins of various design, from makeshift shacks covered by rusty corrugated metal to modern log homes powered by solar energy. The only common theme among these dwellings was the obligatory pair of moose or caribou antlers adorning the front entrance, and the fact that most material had been transported here, piece by piece, after a boat ride down the Tanana. You really have to want to �get away� to maintain a residence here. The jet motor was essential as we navigated upstream through riffles barely 6 inches deep, manually coaxing the motor to stay in gear and �up on step� through the shallows. A couple large broods of almost fully grown common mergansers calmly observed our passing from their perches atop logs lain across the surface near shore. 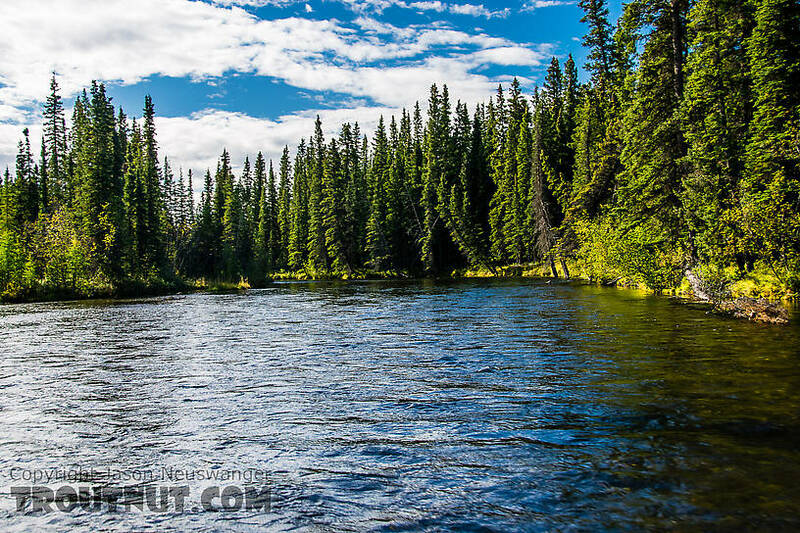 Once we passed all the private cabins, we would search for a good site to establish base camp in the vicinity of runs or pools where Arctic grayling could be filmed and captured; but good campsites along the dense riparian corridor were few and far between. After traveling several miles upriver and beyond the last of the cabins, I began to feel that we were burning valuable daylight. Finally we arrived at a sharp bend where the river widened considerably and the tip of the peninsula on the inside of the bend held promise as a campsite. Jason had his heart set on traveling further upstream before stopping, but I convinced him to motor to shore and have a look. With only a couple hours of daylight left, I was ready to find a reasonable place to camp. This site turned out to be ideal. Though not used in recent years, there was a small fire ring that we later learned was made by moose hunters in seasons past. There were a couple spots high and dry enough to pitch our tents, not much brush to clear, an abundance of dead firewood, and a spectacular view of the river in a 300-degree arc around us, making it easy to spot bears that might wander too close to camp. I told Jason, �I just can�t imagine it getting any better than this, son.� Despite concerns that we might not yet be in the heart of his sampling area, Jason agreed to stop here. We tied the boat to a large spruce tree and set to work establishing base camp. With the temperature dropping, our first order of business was to expand the fire ring and gather wood for the evening. Jason found several large rocks while I dug a deeper pit with our camp shovel. Soon we had a respectable fire pit and a crackling fire started with spruce tree sap and fueled by the abundant dead alder branches nearby. After an hour of brush and rock clearing, tents and vestibules were set up. Once our personal gear was safely under cover, we unfolded my Eno flex-fly tarp and made a secure rain shelter over a 10x10 foot area nearby where sampling gear could be stored. Large white spruce and smaller aspen or alder trees were conveniently spaced to hold the guy lines, so all we had to do was clear small brush and vegetation from the area under the tarp. Base camp was established. It was dusk, and the sound of grayling slurping mayflies off the surface of the river was driving Jason crazy. 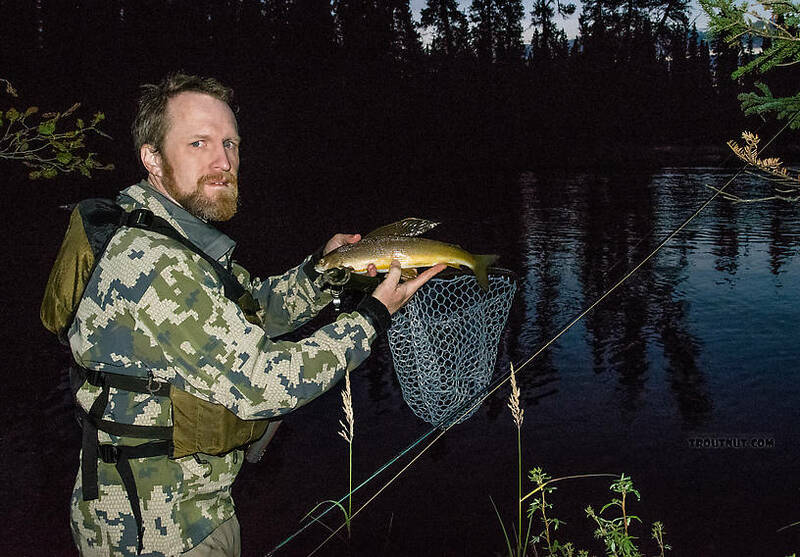 So while I fed the campfire and made Mountain House meals, Jason assembled his fly rod and waded out from camp to drift a dry fly down a swift run before dusk yielded to dark. Before long, he had caught and released the first grayling of the trip � a plump 15-incher I photographed at 10:15 p.m.
We enjoyed a satisfying meal around our friendly campfire; and just as it started to sprinkle rain, we retired to the comfort of our dry tents and warm sleeping bags for the night.